The much-awaited COLEMAN MERRY WAREHOUSE SALE happens on on November 25, 2017 at the Focus Global Inc. Pioneer Warehouse. 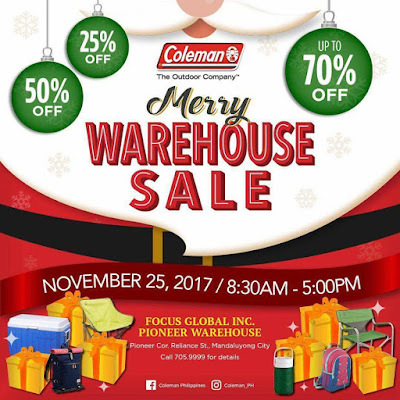 Get huge discounts of up to 70% off on coolers, soft coolers, jugs, chairs, tents, small appliances, craft essentials, and more! Participating products: Coleman, Oster, KitchenAid, Fissler, DMC, and Insinkerator, and more!